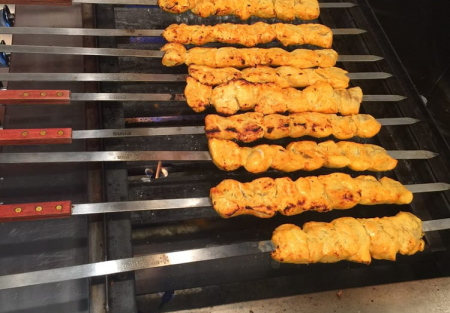 Persian Restaurant in Heart of Valley - Low Rent! Serving this San Fernando Community since 2016 they seem to be doing everything right. With an almost perfect 5 Star rating on Yelp, Facebook and their Business Website they are truly a favorite for anyone that has happened upon them. Using Grandmas Traditional Recipes from the old country is leaving their guest craving more.Quality ingredients are a must as there is no scrimping on the ingredients they choose to prepare the menu items. The restaurant had a recent remodel and has a beautiful look and very inviting feel. With seating for 24 guests. Center is located off a very busy street corner. Just Blocks from a large recreational center with ball fields, tennis courts, basketball courts and more. With Sales in 2017 over $300,000 and a Net Profit round $60,000 this is a nice profitable restaurant, SellingRestaurants has not verified these numbers and buyer must do their due diligence. The Restaurant is run by a wife and mother of 2 children and she is finding it is taking to much time away from her family and feels she is needed there more so she is looking to sell the business. There are 2 hoods, one in the front where the food is cooked where guest can see and smell the items being prepared and another in the back area where the preparation takes place. With a Great Lease of only $2500 Gross per month with 4% vs CPI increases. This would make a perfect Family Run Business. So don't delay in coming by to check this place out and see if it's not just the right restaurant for you. Just click the "SIGN NDA" tab and you're on your way.